I think we are beginning to see a pattern here. "There are growing fears that strong winds have dispersed the pollution more widely than previously thought. At least one person has died during the clean-up operation, after being thrown from a ship by waves and drowning in the oil. 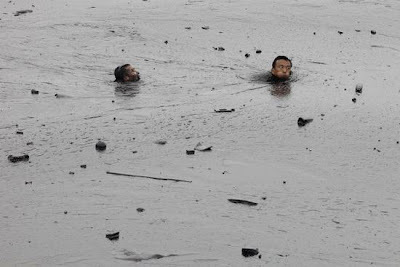 The oil spilled into the sea in north-east China after two pipelines exploded on Friday night, resulting in a fierce fire. Officials say an area of ocean covering 430 sq km (165 sq miles) is now polluted - oil-eating bacteria and oil-skimming vessels are being deployed to remove the slick, which Greenpeace says is China's worst in recent memory. "